4.4 out of 5 based on 125 bloggers and 10 commenters. 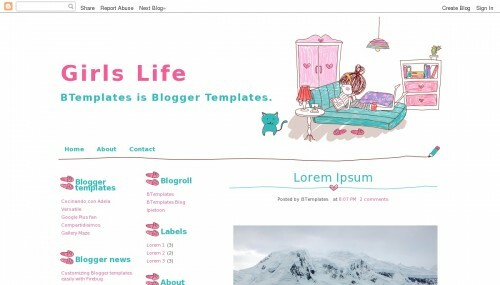 Girls Life is a free blogger template with 3 columns, left sidebar, an exclusive design for Blogger, cute design, girly looking and vectorial elements. Excellent template for blogs about animals, fashion, home and decoration, love or people. and not able to show the whole picture that i posted..
1) I cant see the share buttons for Google+, Facebook, and Twitter. I love this theme! I’m using it now on my blog!